Iowa Medicaid Director Mike Randol speaks to the Council on Human Services Wednesday, June 13, 2018. Iowa’s Medicaid director Wednesday told the Council on Human Services the state’s privatized Medicaid program is saving money for taxpayers, but his explanation left questions unanswered. 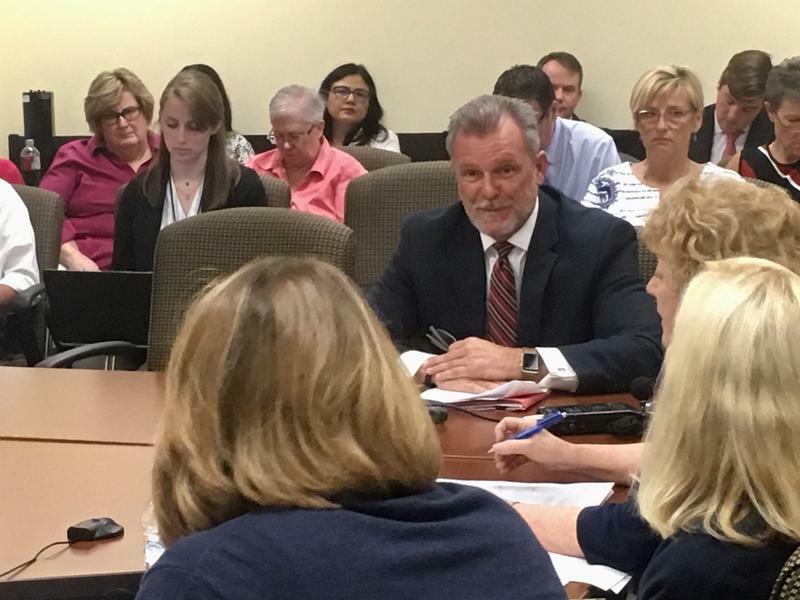 Medicaid Director Mike Randol said the state is projected to save $140.9 million in the fiscal year that ends June 30, compared to what the state would have spent before its health care program for low income and disabled people was turned over to for-profit companies. “I think it’s important to understand that regardless of the methodology, there are savings,” Randol said. He did not explain why the state’s savings estimate for this year tripled after Gov. Kim Reynolds hired him to run the Medicaid program late last year. Randol also did not offer a cumulative number showing savings since the privatized Medicaid program started in April 2016. Randol said those factors and health outcomes were not considered in the cost savings estimate. Ragan asked how the managed care organizations are saving money. Randol said “effective care coordination and case management” help reduce hospitalizations, thereby reducing costs. Council members were not given any documents showing or explaining the cost savings. “I think I’ve been very open about transparency,” Randol said. Randol walked quickly out of the meeting without taking questions from reporters. Gov. Reynolds recently told reporters Randol “would be happy to sit down with the media and walk through the process” of calculating savings from privatized Medicaid. After the meeting, Sen. Pam Jochum, D-Dubuque, said Randol’s presentation was incomplete. “He looked back at pre-managed care and then compared it to a projection of 2018, rather than comparing it to some actual real numbers from 2017,” Jochum said. State Auditor Mary Mosiman, a Republican, recently agreed to conduct a review of Medicaid cost savings after Sen. Jochum made that request. Jochum said the review should consider any impacts on health outcomes for patients and new expenses for care providers resulting from the implementation of managed care in Iowa. Iowa is one of 38 states that radically changed the way it runs Medicaid over the past few years. The state moved about 600,000 people on the government-run health program into care that is managed by for-profit insurance companies. The idea is that the private companies would save the state money, but it has been a rocky transition in Iowa, especially for people like Neal Siegel.